Would you really jump in the ocean while wearing an $8,000 to $12,000 watch? I'm not sure that I would. I'd look into a nice beater watch. 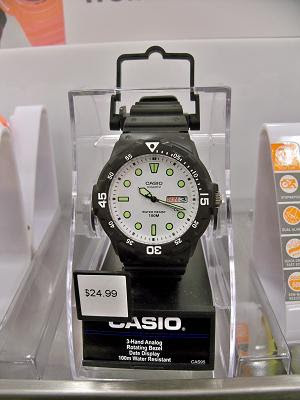 I recently saw this Casio Men's Sport Analog Dive Watch (Model MRW200H-7EV) at Kmart on sale for about $20. It would have been a great buy, but I didn't need to add it to my watch box.